If you had to choose just one exercise to help clients improve strength, power and core stability all in one move, you’d probably choose the squat. That’s why many consider the squat to be the king of all exercise moves. In addition to working the quadriceps, a proper squat recruits muscle fibers from the hamstrings and glutes. It also forces the core to engage and the upper body to stabilize, making it a nearly total-body exercise. 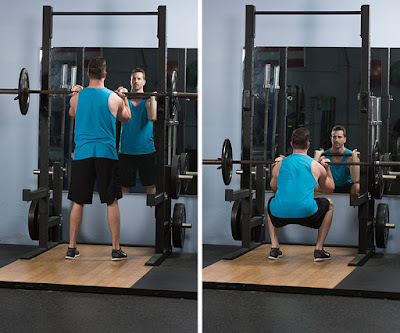 There are numerous variations of the basic squat, which you can use with your clients to recruit different muscles and help stave off boredom. In addition to the basic body-weight squat, here are five squat variations to add to your exercise arsenal. Before trying variations of the squat, help your clients master this exercise using only their own body weight. Stand with feet shoulder-width apart; cross the hands at the chest or extend the arms out in front to help counterbalance the body. Bend the knees and lower the body as if sitting in a chair. If possible, lower the body until the thighs are parallel to the floor. Return to the starting position by pushing the heels into the floor and straightening the legs. During the entire move, be sure to keep the feet flat on the floor, the core engaged and the back as straight as possible. Also, try to keep the knees in line with the ankles while in the squat position and do not let the knee cross in front of the foot. 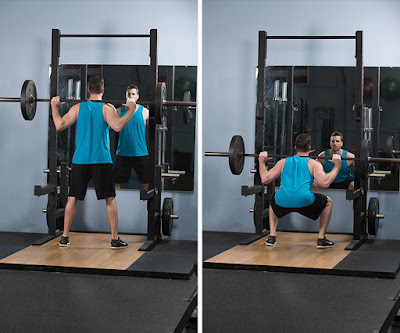 After mastering the body-weight squat, clients may progress to the Barbell Squat. The additional weight from the loaded barbell in the squat rack will recruit more muscle fibers than a body-weight squat, so clients will see quicker improvements. Stand with the feet shoulder-width apart and a loaded barbell resting comfortably on top of the traps, just below the back of the neck. Bend the knees and lower the body as if sitting in a chair, until the thighs are parallel to the floor. Return to the starting position by pushing the heels into the floor and straightening the legs. During the entire move, be sure to keep the feet flat on the floor, the core engaged and the back as straight as possible. Also, try to keep the knees in line with the ankles while in the squat position and do not let the knee cross in front of the foot. For concentration, it helps to keep the eyes looking forward and locked in on a focal point. Squats work many muscles in the legs, but the Dumbbell Sumo Squat is particularly effective for focusing on the muscles of the inner thighs. Stand with the feet wider than the hips and the toes pointed out to the sides about 45 degrees. Hold one dumbbell in both hands and extend the arms toward the floor. Bend the knees and lower the body until the thighs are parallel to the floor. Straighten the legs to return to the starting position. Keep the arms straight and close to the body throughout the entire movement. Also, try to keep the knees in line with the ankles while in the squat position and do not let the knee cross in front of the foot. The Front Barbell Squat involves squatting deeper than most other squat variations. Stand with the feet slightly wider than the shoulders. Rest a barbell on top of the front deltoids; it helps to cross the hands on the chest and extend the elbows in front of the body to help balance the barbell. Bend the knees and lower the body as if sitting in a chair, until the thighs are just past parallel to the floor. Return to the starting position by pushing the heels into the floor. During the entire move, keep the feet flat on the floor, the core engaged and the back as straight as possible. For concentration, it helps to keep the eyes looking forward and locked in on a focal point. If your clients have trouble performing a traditional squat or if they are up for an isometric challenge, try the surprisingly difficult Wall Squat.